The ideal adult human male proportions. 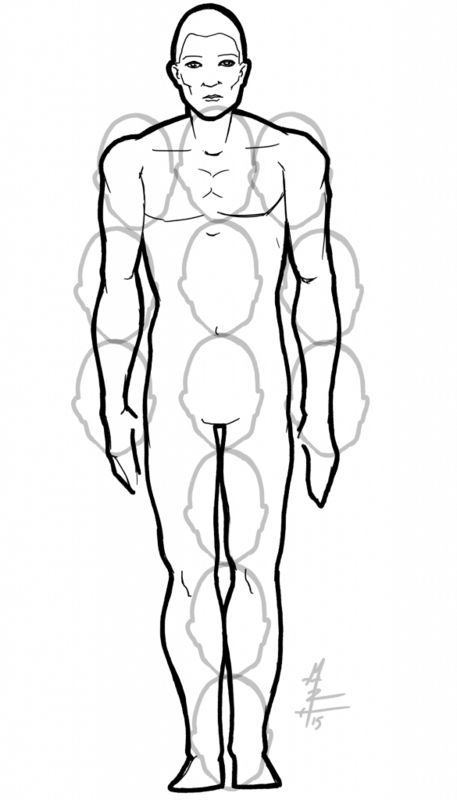 When drawing a ‘hero’ type, the ideal proportions for an adult male is 8 heads high. The arms are three heads in length, and the frame is three heads in breadth. Obviously this is not the case for all adult human males, but it’s a good place to start from as a ‘norm’. Consider this body a ‘mesomorph’ type: compact and muscular. I’ll add future updates with ectomorphs and endomorphs. Tagged art, black and white, digital art, digitizer tablet, drawing, drawing tutorial, how to. Bookmark the permalink.